Sea View suite is a large air-conditioned room on the 1st floor ( 36sqm) featuring a wooden balcony with garden furniture and its own wooden stair-case entrance to the room. The room and balcony is overlooking the pool & tropical garden area with views across the False Bay towards Table Mountain. It has a fridge, a safe-box, coffee-, tea-, water station filled up daily and a flat TV-screen. 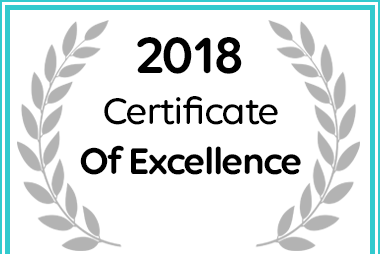 Gordon's Bay Guest House received a Certificate of Excellence for 2018.